"45 mins to deposit cases"
✅ Trip Verified | Firstly, my daughter and I (after arriving early, so we could eat!) encountered the stationary baggage queue (courtesty of BA) and despite joining the queue before it opening (2 hours before flight) we waited 45 mins to deposit cases. We complained and were told, there had been a problem. Secondly, immediately afterwards, we queued again for security, and I remembered a disposable bottle full of water (approx. 1 litre) in my bag. Already well into the queue, I assumed there would be somewhere to dump the liquid at some point (as is in UK and USA), I found a bin with plastic bottles in it and attempted to empty water into it. An extremely rude member of security (aisle 5) shouted at me for some minutes in German, much to my surprise and upon realising I didn't understand a word, told me to "do as I would at home"! I was doing exactly what I would have done in the UK and was then told either to exit the queue to dump the water in a toilet (which evidently would have resulted in my missing my flight) or that I had to drink the whole lot! I figure this was an exercise in humiliation, and one I had no choice in assuming I wanted to catch my flight. Immediately after this horrible episode I sought a place to complain and found a friendly guard who attempted to mediate to no avail and then suggested I formally complain. As I was speaking to him (10 mins) my daughter saw our flight was boarding and dragged me off to get in that queue. Passport control again and another 30 minute queue, which resulted in us running through the gate as they were closing it, 3 minutes before scheduled flight. I attempted to mention my concerns to the the same BA stewardess who had handled our baggage, only to be told that "it wasn't her fault"! I was in a complete state by the time I boareded and had been convinced (through no fault of our own) we were going to miss our flight. We had queued for the whole 2 hours - no duty free, no meal, no way I will ever visit Cologne again. A lovely BA stewardess explained that this is a new route (6 weeks), but there is no excuse for this kind of treatment, it leaves the bitterest taste from our 5 days away. Not Verified | The security and immigration staff are appalling. When we were there they had two immigration booths. One was shut so everyone was queueing for the open one. They then opened both booths for approximately 3 minutes so people spread across the 4 queues and then shut the first queues they had open. Why? If they want to change staff over why not do it in the same booth! Once you go through security the amenities are very poor. There are no visible screens providing flight information, no charging points for phones and only one refreshment shop. Completely random there is a solitary table football table. So best reserve if you think there will be a queue. ✅ Trip Verified | This is quite a small airport, there is plenty of seating around the gates in Terminal 2. There is not a large selection of food and drinks, in the non-Schengen gates, there is only one store which is quite expensive. The terminals are linked landside only. The most annoying part of the airport is that gate calls are played across the entire departures area, so every minute there is a call for a flight, which can get frustrating. There are very few charging points, you will find some in the cafes, however they are under the tables usually. Strange for such a modern terminal to not include hardly any plug sockets. Good views of the runway from most of the airport. No queues at security or passport control. There are indoor smoking booths near the gates (airside). "airside services are very inefficient"
Not Verified | There are many nice cafes and shops on the non airside, but the airside services are very inefficient. We waited over 30 minutes at B02 baggage carousel for our luggage from a Eurwings EW397 flight from Dublin in Friday July 27. The first group of bags appearerd after 25 minutes wait. There was then a gap of 6-7 minutes until they started to load the second (and final) group. Very slow and no staff or service desk available. ✅ Trip Verified | Arrival and departure from this airport . Inbound the queue for immigration was perhaps 10-15 minutes but at least it was a spacious area in T2 unlike Manchester T3. Airport clean and spacious. Inbound today at the same terminal security was a pleasure with perhaps a 3 minute wait max. Facilities airside are excellent as are the transport links landside. If only Manchester was up to a similar standard than flying would be a pleasure. "rudest check in and security staff"
✅ Trip Verified | The rudest check in and security staff. You end up just wanting to leave as fast as possible. Impolite, tough, non English speaking in an international airport and not making any effort to facilitate the issues or help. They could try harder given the not small amounts of airport taxes! ❎ Not Verified | Next time I’ll visit Cologne, I’ll drive there by car or by train. I came there from Hamburg, this airport is a complete disappointment and the worst thing this great city has! To be fair, it’s well connected by train, suburban and regional trains in the direction of Cologne Central Station and Troisdorf/Siegen/Frankfurt arrive there, mostly on-time and it has a station for coaches. The queuing times are also good but inside the building there is a lack of shopping facilities, especially behind the security scanners. I couldn’t find a single restaurant in the terminal area and outside the gate area it is expensive. The terminals aren’t even clean, there is a lack of (uncomfortable) seats and the wifi is just very slow. At least the staff is good because they’re friendly (such as most of the Cologne-citizen), organized and they definitely know how they can help you. ✅ Verified Review | I use Cologne airport quite frequently. The connection to the city centre by train (quite cheap, around Euro 3) or car is easy. The airport has just the right size: Large enough to offer many connections, small enough to be very efficient. Queues at check in and security are not predictable, sometimes you can just go ahead, sometimes you have to wait for about 20 minutes. Behind security you find only very few shops / restaurants, but I think this is ok, because the airport is not a hub. I saw some reviews here, that one should prefer Dusseldorf as an airport to travel to Cologne. I cannot support this opinion at all: Departure (security!) 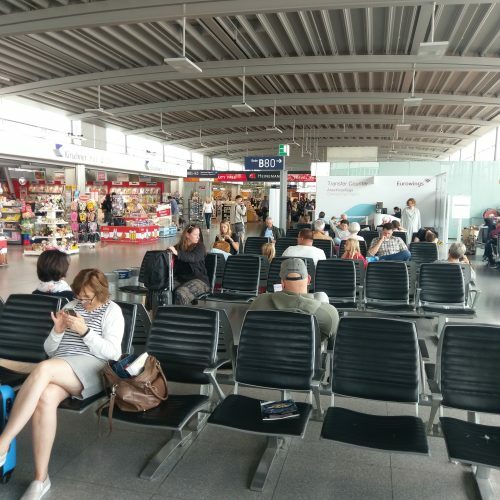 and arrival procedures in Dusseldorf are much more time consuming, one needs quite some time to transfer from the terminal to the airport train station and then you still have a quite lengthy trip to Cologne main station - usually in cramped trains - ahead of you. "good opportunities for food and shopping"
✅ Verified Review | Cologne/Bonn is a nice middle size airport with two terminals. Nothing is really spectacular. Airport is clean and there are good opportunities for food and shopping. Negative aspect is that the airport is not rigorous regarding fast lane passengers. Sometimes the queues at the security are mixed and sometimes there not enough staff for fast lane customers such that waiting time in regular queues is even shorter. The seating design in terminal 1 is really bad, the access to the gates are always very crowded. Terminal 2 however is better regarding this issue. Terminal 2 is brighter and much better designed then Terminal 1. ❎ Unverified | I have to say, this is the best run airport I have passed through, the security was top notch and everybody was thoroughly screened. 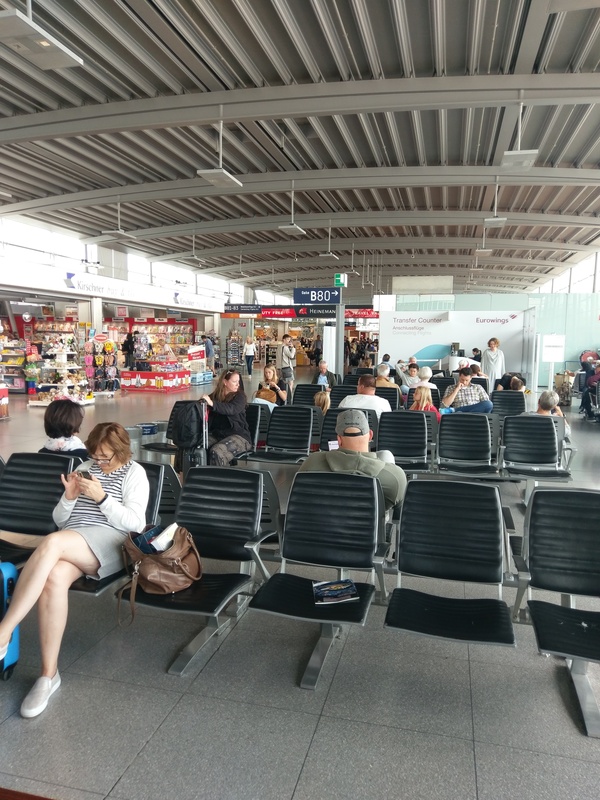 The staff were helpful, and the airport as a whole was calm, unlike the mad rush and confusion at Stansted where only a small percentage were checked. Here at Cologne airport, everybody was checked.